Fusion Summon 1 Dragon-Type Fusion Monster from your Extra Deck, by banishing Fusion Materials listed on it from your field or Graveyard. This card's effect is the same as Overload Fusion, but for Dragon-Type Monsters of any Attribute. This card could be a reference to an episode of All Grown Up! called Yu-Gotta-Go, a parody of Yu-Gi-Oh!. In this episode, one of the main protagonists becomes obsessed with this universe's incarnation of the card game and constantly searches for a particular monster card called Red Mirror Dragon, whose artwork is strikingly similar to this card's own. 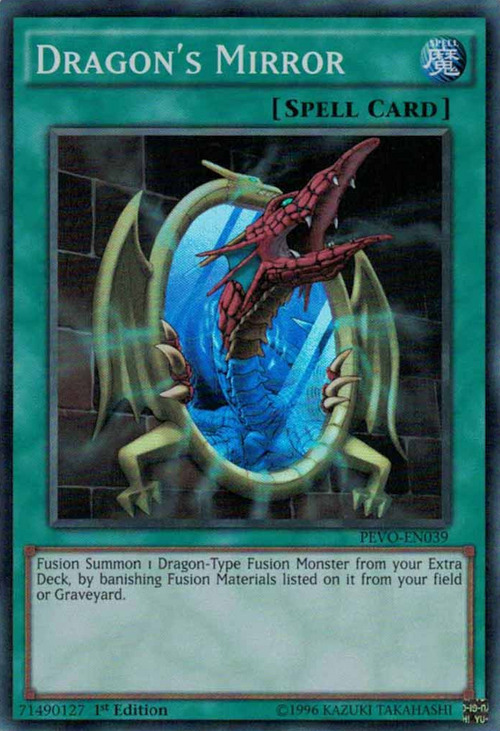 If "Kycoo the Ghost Destroyer" is on your opponent’s side of the field, you can activate "Dragon's Mirror" if all the Fusion Material Monsters are on the field; however, if any of them are in the Graveyard, you cannot activate it. You can use Fusion Substitute Monsters like "King of the Swamp" and "Goddess with the Third Eye" for "Dragon's Mirror". "Dragon's Mirror" does not target. You select and remove the monsters during resolution. 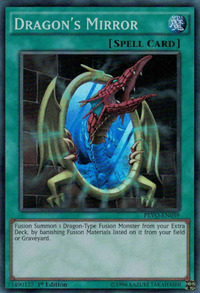 Non-Fusion Area: You cannot activate "Power Bond", "Miracle Fusion", or "Dragon's Mirror" when this card is active because they are treated as Fusion Summons. You can activate "Fusion Gate", but you cannot activate its effect.